Ces informations sont données à titre indicatif et n'engagent pas Sun Microsystems. Overview: During my recent MySQL testing I was curious to see how well performing PostgreSQL on the same workload. Two years on the same test case PostgreSQL was two times faster comparing to MySQL. Now, for my big surprise, it was two time slower then MySQL 5.4. Of course MySQL 5.4 made a huge step in performance improvement, but there were several signs for me - something goes wrong with PostgreSQL... So I've planned to retest it again an go more in depth to understand observed performance difference. My intention is to replay exactly the same tests as in my previous report but on the newest M5000 (quad core) server. So I'll skip all previously made explanations about db_STRESS tests and scenario and go directly to the action. NOTE: All PostgreSQL binaries are compiled with GCC 4.3.2 in 64bit, with CCFLAGS="-O3". NOTE: Initially I kept the same buffer pool = 12GB as MySQL. As PostgreSQL is delegating its read cache to the filesystem too it'll be more than enough (and as you may see from workload graphs there is practically no disk access during Read-Only tests). NOTE: most of tests were run with a second thread enabled on each CPU core. To put attention on this point I add a mention about number of core threads on used labels. For example 8cores become 8cores(2) (or cores=8(2) for ex.) if both threads were activated on each core. Otherwise 8cores remaining only 8 cores were active with only one thread. Also, when test is "executed on N cores" it means PostgreSQL is running within a processor set of N cores, so it cannot use more than N cores for its processing and nobody else may use its cores from its processor set. If on Read+Write workload we may discuss about differences on transactions integrity between PostgreSQL and MySQL and it may be long (even if InnoDB nowdays gives the same security level). So I've concentrated my analyze first on the Read-Only workload. Generally 8.4 version is more performant than 8.3.7, good point for development team! On all my test workloads PostgreSQL delivering a very stable performance ! Since 16 cores 8.4 is way faster than 8.3.7 ! PostgreSQL 8.4 is scaling much more better: true performance gain (~100%) on move from 8 to 16 cores, and there is still a gain of ~40% on move to 32 cores! To be honest , I should not consider too much my results on 32 cores as injector processes are running on the same server and may bring some background effects on the database engine. But injectors are using less than 20% CPU and as PostgreSQL is still continuing to improve performance here I present them anyway: specially it gives a good example of performance improvement done within 8.4 version, as well it presents the best result reached by PostgreSQL on this server - 11.000 TPS on the Read-Only workload. 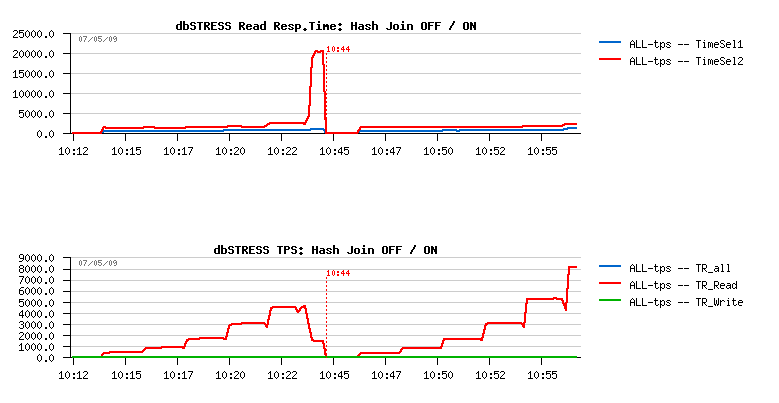 From my point of view the main problem here is a query execution time comparing to MySQL. As you may see from the benchmark description there are 2 SELECT queries executed during each Read-Only transaction. The first select is running very fast in most cases. However the second one is usually taking more an more time with growing workload. Even if this query is executed extremely fast, it's still 2-3 times slower comparing to MySQL! 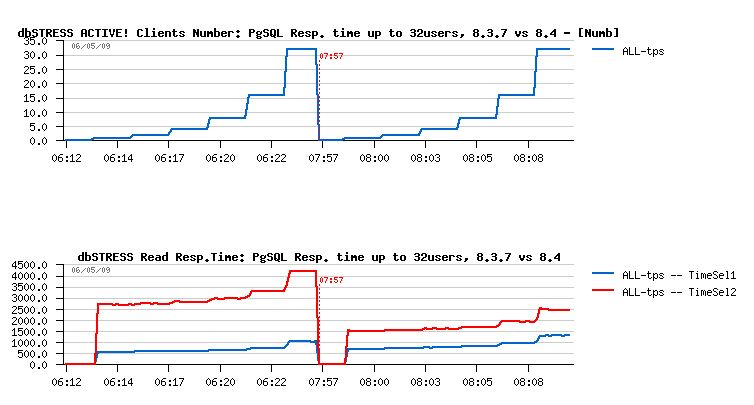 Due this twice better response time PostgreSQL 8.4 is outpassing 8.3.7 I think. And it's still unclear what was a scalability limit for 8.3.7 on 16 and 32 cores, because with a stable response time it should deliver a much more higher performance. But as you see, response time is growing too, and before to look about any scalability improvement it'll be better to see first if there is any way to run this query faster! Seems disabling hash join is the most trivial option to test (still need to understand what is the most optimal way to force planner to use it), but for testing even using a global hashjoin disabled is enough. of course 1ms is a very small value, but for very fast queries it'll be important! Moving step by step back in my investigations and removing option by option I finally found the only thing which may bring some unexpected changes: default_statistics_target !... - playing with this parameter and trying to obtain the most optimal execution plan I left 8.3.7 database with tables analyzed with target 1000 and continued my tests. While the first results on 8 cores were obtained with a default target - 20 !!! version 8.3.7 has now similar results as 8.4 - the difference is gone !!! most of the results are improved by ~20% !!! The most classic solution to reduce checkpoint impact on performance is simply to reduce checkpoint timeout - it will involve checkpoint more often, and as during a shorter period there will be less modified data - less pages will be needed to flush, so checkpoint itself will be shorter. Of course it'll not completely remove a checkpoint impact, but it'll be shorter and lighter. since 8.3 there is an excellent checkpoint_completion_target option! In short the idea is instead to flush all modified data at once on checkpoint, the database engine receiving a time credit to finish the whole required data flushing. The checkpoint_completion_target is set from 0.0 to 1.0 and represents the time ratio you leave to your database server to finish checkpoint before the next checkpoint arrives. For ex. with checkpoint_completion_target=0.8 and checkpoint interval 5min it means you leave 4min for your database to finish its checkpoint completely. Is there any danger for data - absolutely no, as all changes on marked for checkpoint and not yet flushed pages are still kept in WAL, so you don't loose then in case of crash..
You may find a lot of more details from PostgreSQL documentation as well an excellent Checkpoints and the Background Writer guide written by Greg Smith. Buffer pool size - supposed to impact directly checkpoint time as a bigger buffer pool will contain more pages to scan. On the same time I observed also an important impact on Read-Only workload. Despite it, but performance was better with a 4GB buffer rather suggested 256-512MB.. Finally knowing initially observed TPS limit on Read-Only, I tried to find the most optimal value for both Read-Only and Read+Write workloads. And 4096MB gave me the best result. Checkpoint interval - 2min was the most reasonable (30s was too short, and 5min was too much) - I keep here in mind a recovery time needed to be planned in case of the system or hardware crash. So 30s (the smallest possible with PG) is too stressful for database, but 5min is too much as potention recovery (it may be way longer than 5 minutes). And 2 minutes was just enough to satisfy both. checkpoint_completion_target - 0.8 was the most optimal value to keep stable writing and good performance level. Prepared statement is no more sensible to the default or any other analyze target as those data are only used during prepare phase, and no more used during query execution! Scalability issue is remaining a question without answer for the moment... If on the Read+Write workload it may be easily delegated to the limitations of the storage box, on the Read-Only workload there is no really any limitations coming from a hardware. All needed data are kept in memory, no disk access, no network..
DTrace tracing did not bring in evidence any hot locks for the moment.. Performance is greatly improved comparing to my previous tests! So, globally I'm very happy with obtained results - they are honest and demonstrating the current maximal PostgreSQL performance on db_STRESS benchmark! target analyze impact -- if you're not using prepared queries and your queries are running very fast - take care about target analyze! also, keep in mind it may be set different per table! hash join impact -- sometimes using hash join may be slower..
prepared statement benefit -- for sure the best way to run your queries with a minimal cost! checkpoint completion target -- excellent way to lower checkpoint impact! more lower is the total query execution, more important the part of this cost become..